A Smallstuff dummy chain is THE solution in order to always know where your child’s dummy is! 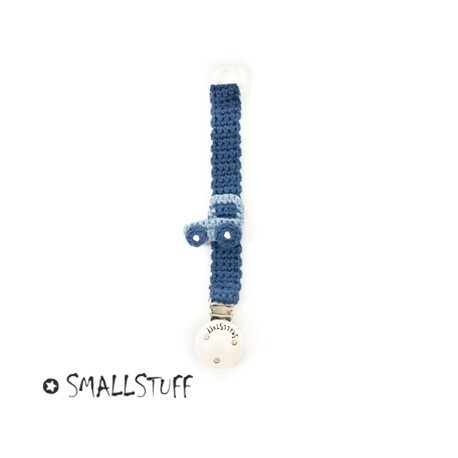 This dummy chain by Smallstuff is made of crochet and 100 % cotton. It is 19,5 cm long. It has a practical 100 % non-toxic wooden clip and the dummy attaches on the chain with a little silicone ring. This Smallstuff chain cannot be washed by hand or by machine but can be easily cleaned with a humid cloth. Like all ByHappyMe’s dummy chains, Smallstuff’s dummy chains are conformed to the security standard EN12586:2007 and A1:2011.